A few months ago I mentioned on this very blog that my creator owned title “Atomic Toybox” was about to resurface. I didn’t want to say to much until I had a signed deal by a publisher for fear of jinxing myself. Well, I do have a signed deal with Dark Horse Comics to publish a 4-issue mini series. The only problem at this point is getting it done! Since it is a creator-owned book the pay is very low so I have to continue working at DC as my full time gig and working on my project on the side. The good news is I have the scripts for all 4 issues complete and the story will finish up the initial storyline that I introduced in my one issue I originally published through Image back in 1999. So those of you who read that very first (and only) comic will finally be rewarded with the whole story! The big question is: how soon can I possibly pencil and ink 4 comic books in my spare time. I can’t exactly answer that as of yet since I just started drawing the book. But I am very optimistic about having the first issue out before the end of this year and then every subsequent issue out on a monthly basis. The other bit of news is the book will no longer be called “Atomic Toybox”. I know those of you who are familiar with the original comic will probably be ticked for changing what is essentially a fun but non-sensical title and those of you who have never heard of it probably couldn’t care less. I wanted for years to go with a title that better described the content of the comic. I originally wanted to call the book, “Power Ball” and the cube or box would have been a sphere. However, the Oregon Lottery already had that name so I somehow came up with Atomic Toybox. Of course, whenever you have a name associated with something for that long any new name is going to sound inferior to the original if for no other reason than your used to the old one. As you can see the 3 in the cube should be understood as Power to the third or Power Cubed! I think it is strong title and makes a lot more sense as to the content of the story. All though, there is always the possibility that people will see it as “POWER 3″ and not get it all. That’s why I am getting out in front of it here! Also, let me share with you the first page of the comic. Those of you who bought the original will recognize the page. This is a redrawn version of the original first page to the comic. Only two pages from the original comic will be in the new imagining. But both will be redrawn to better represent where I am at as an artist now. The story follows the same storyline but it is told in a much different and better way. I will continue to post about the progression of the comic as we get closer to publication date. This is the era I was really waiting to do. I grew up reading comics in the 1970’s so my familiarity with the books of this decade is the greatest. I am not looking back removed from the historical context of the time, I lived during it! My discovery of comic reading at around age 8 or 9 changed my art path from a desire to be an animator to become a comic artist. This list could easily just be Neal Adams covers but I was able to squeeze in a few others that really made an impression on me as a kid and still do as an adult and professional artist. The 70’s was really similar to the decade of the 50’s in that comics experienced an artistic renaissance. 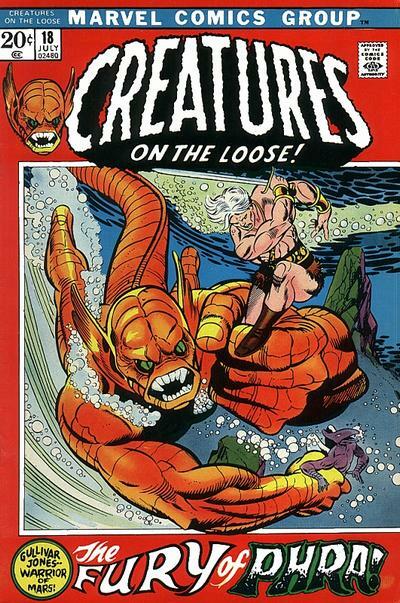 In the 50’s many highly talented artist’s came out of the woodwork to produce mostly non-superhero comics (generallly for EC Comics) and the same thing happened in the 70’s. Superhero popularity and comics sales in general were down and along came fantasy, sword and sorcery and monster books in an attempt to find a new audience. With these type of books came very talented and illustrative artists. The type that the industry had rarely seen before. Here is my attempt to squeeze a decade of brilliant comic work in to 10 choices. Once Barry Windsor-Smith shook off the Kirby influence he became one of the greatest comic book illustrators of all time. His level of detail in his work was jaw-dropping and no doubt peeved a lot of the old school artists of the time. 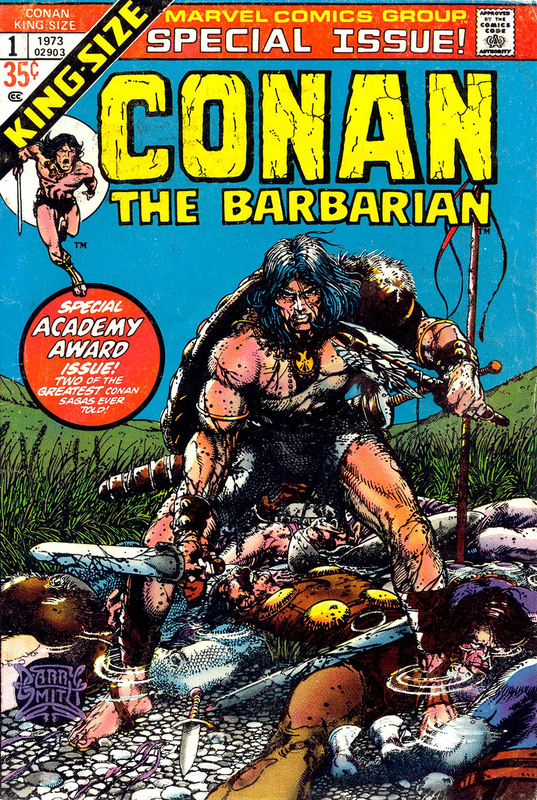 His run on Conan is legendary but this piece is BWS at his best. The drawing is fantastic, the detail is unbelievable and the story telling is great. This deserved better than a mere comic cover. 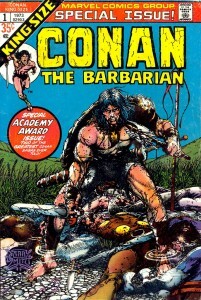 King Size Conan the Barbarian #1. 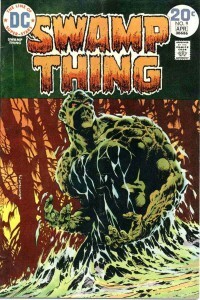 Outside of Frazetta, Berni Wrightson was the single greatest artistic influence on my early style. So I could easily fill this list with his work but I have to stay true to the process. I must note that I am not including any of the Warren Magazine covers because technically they were Magazines. 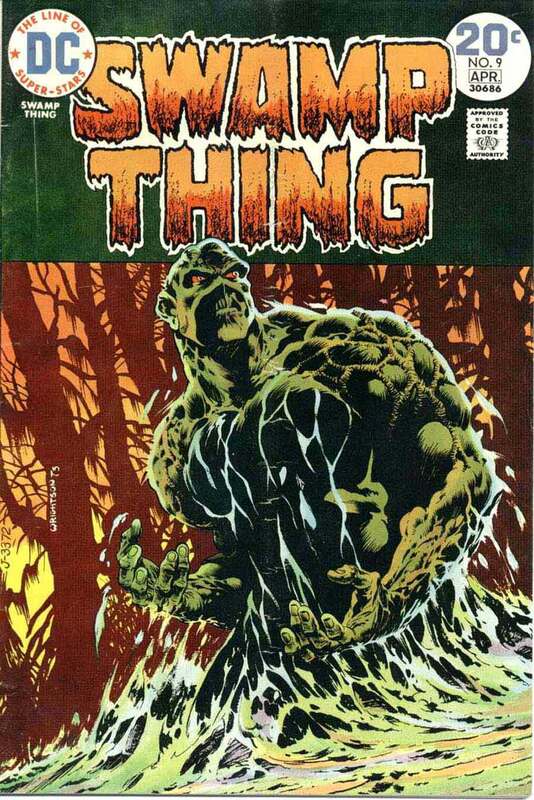 (plus it makes my choices a little easier) Here is the best cover of Wrightson’s legendary run on Swamp Thing. Okay, here it is, possibly the greatest comic cover of all time. (I think that’s the third time I have made that claim) So let’s say definitely top 5. 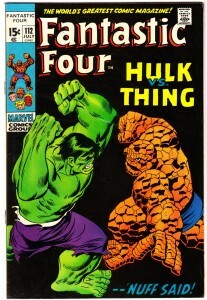 Once again Buscema delivers great dynamics, great design and great impact. 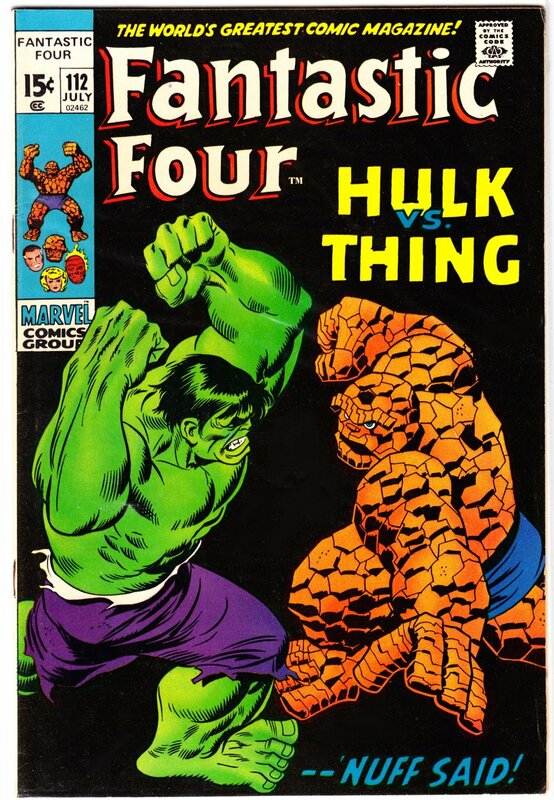 This is the first comic I ever bought simply on the merit of the cover. I had no idea who the characters were but I didn’t care. Now that speaks volumes. ‘Nuff Said, indeed! Fantastic Four #112. Let’s begin the Neal Adams parade. 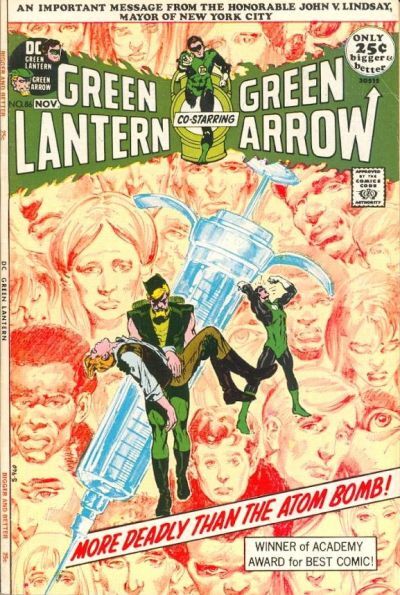 Certainly one the greatest comic artists to ever pick up a pencil, Neal delivered great cover after great cover. If you needed a book to sell, you got Neal to do the cover. If DC had done more covers like this in the 60’s Marvel might not have buried them. I still get scared every time I look at this! Batman #237. Most of Neal Adam’s memorable covers came while he was working on Batman and Detective Comics. However, there some really great Superman covers in there as well. This is clearly his best and most famous one, which is why it is on this list. Instantly iconic. 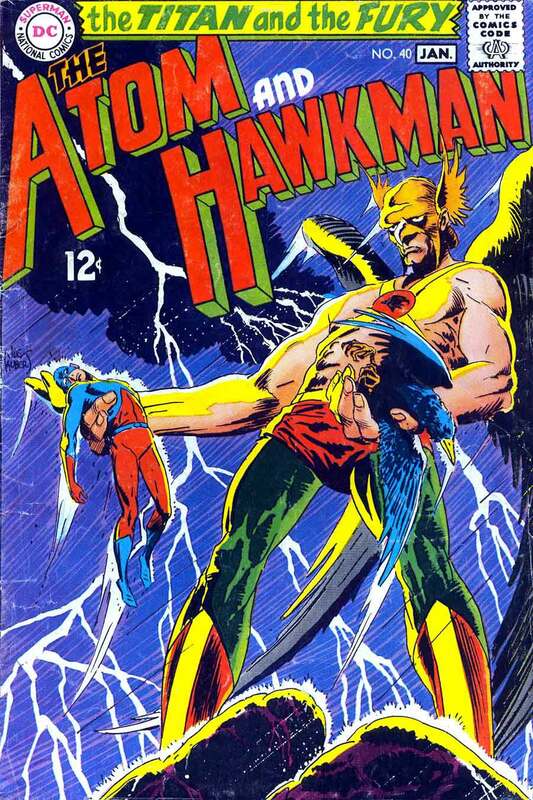 Again, picking just three Neal Adams covers is really impossible, so I guess I did the impossible. Here is the third and final entry by Adams on my list. I’m sure many are saying, “What?! No Green Lantern #76″? You know as famous as that cover is, I can think of several I like better. This is one of them. Not only in design but impact, relevance and deft handling of touchy subject matter, this cover succeeds on every level. 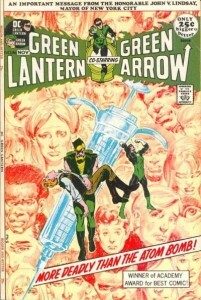 Green Lantern/Green Arrow #86. For me, Mike Ploog is the ultimate fantasy and monster artist. Give the guy a monster or an elf to draw and no one can touch him. His rendition of Man-Thing was the best by far. 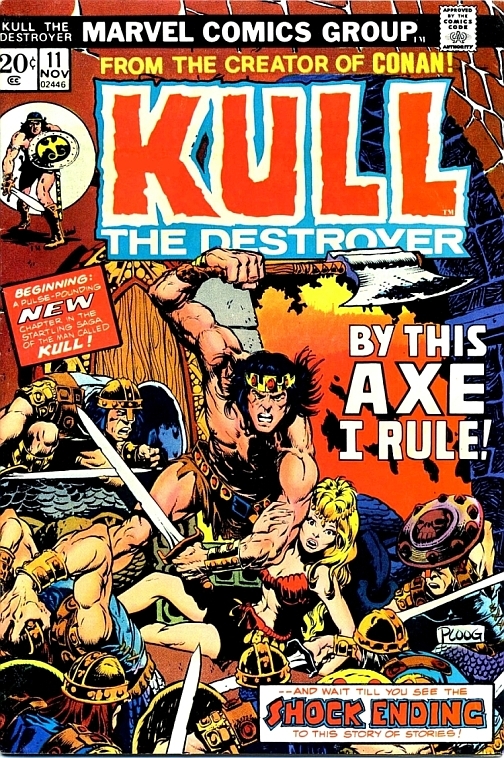 But somehow, someway, he took this Kull cover and made it into something legendary. I just absolutely love this cover. 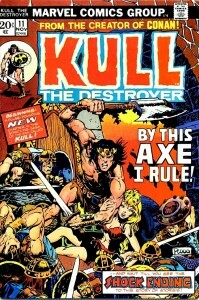 Kull #11. Uh, oh, we have another Berni Wrightson sighting. What made Wrightson’s 70’s work so special was his ability to use blacks to create volume and atmosphere in his art. 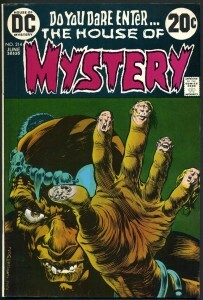 Wrightson did several covers for DC’s horror comics, House of Mystery and House of Secrets and these covers showcased Berni’s best comic work outside of Creepy and Eerie magazine. Powerful, startling and masterfully drawn and it still freaks me out. 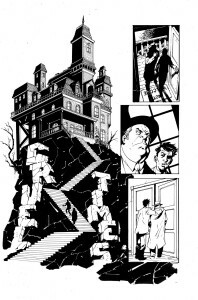 House of Mystery # 214. Frank Brunner was quite the star in the 70’s but we didn’t hear much about him after that. He is probably best known for his very limited but impactful work on Howard the Duck, Dr. 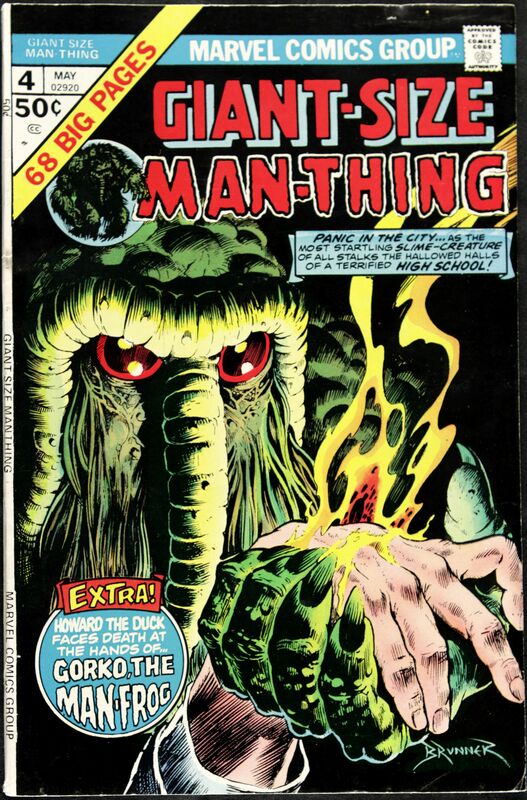 Strange and Man-Thing. Brunner did several really nice covers but the three that stand out are Dr. Strange #1, Howard the Duck #1 and this. The close up and dramatic lighting really make this cover jump out. 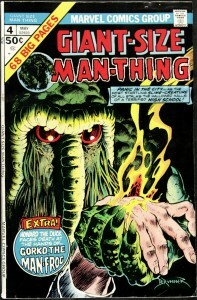 Giant-Size Man-Thing #4. Where’s Gil Kane, one of the great cover artist’s of all time, you ask? Right here! Gil was hard to decide upon because much like Nick Cardy and Alex Schomburg he did a lot of really good covers but not very many that clearly stood out from the rest of his work. This one resonates with me because of the emotional power. Is Captain America dead? Well not Steve Rogers, we see him in the background, but his replacement is and you can feel the remorse and guilt flowing out of Nomad and the Falcon. Not to mention the absolute shock of seeing an iconic hero being so unceremoniously killed and strung up. Captain America #183. All right I’m cheating. I can’t pick just 10. This was the era that I grew up reading comics in and this is also my last cover list because it’s just too hard and too many of my friends have work in the 80’s and beyond so I don’t want to get in trouble for not picking one of them. With all that in mind here are 5 more covers from the 70’s that rock and should be in the top 10 but are at least in the top 15! Finally, a Nick Cardy sighting. Now maybe Dan Mishkin won’t kill me. As I stated previously, Cardy did a lot of really cool covers for DC. He really rivals Neal Adams with his creativity. 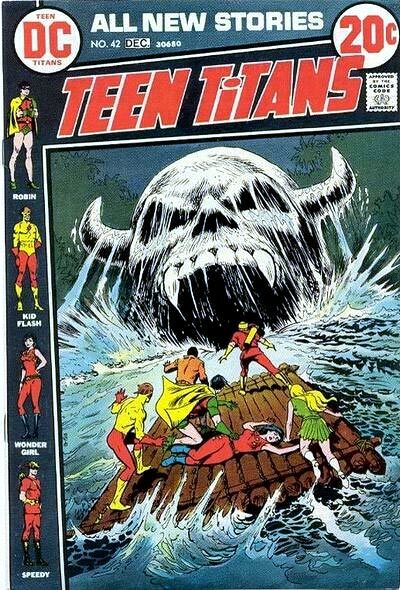 This is the type of cover that would make a Marvel Zombie buy a Teen Titans comic. 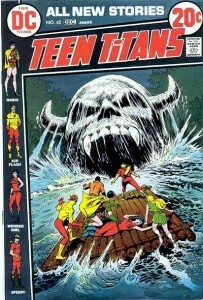 Teen Titans #42. I had to get one more Gil Kane cover in here. This one doesn’t have the emotional impact that my first choice does but it has everything else. We all know Gulliver of Mars is a John Carter rip-off but who cares?! I’m buying this comic anyway! Give me some 3-D glasses! Creatures on the Loose #18. It’s Brunner time again. Too bad the Spider-man blurb is on this cover, otherwise it would be up higher on the list. 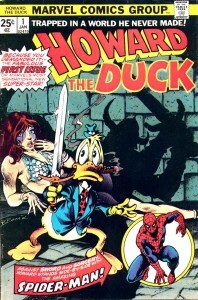 Still, a duck with a sword defending a maiden in distress, who was expecting anything like this on the spinner rack? Not me but I grabbed it the second I saw it and it had low distribution to boot! Instant collector’s item! 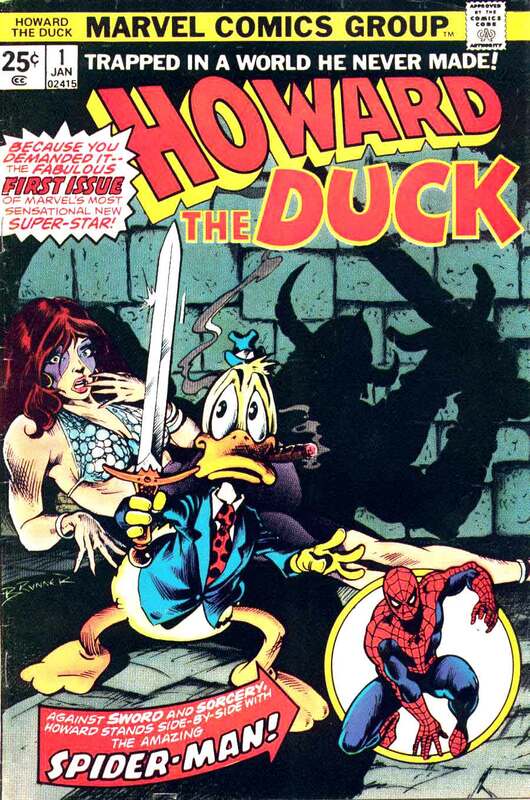 Howard the Duck #1. 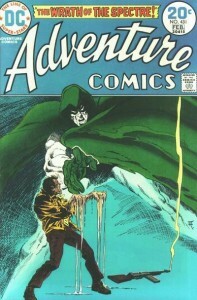 If you haven’t read the Spectre series that ran through Adventure Comics in the early to mid 70’s shame on you. 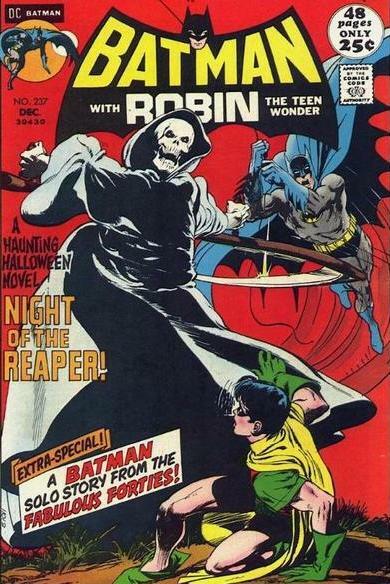 Startling good stories and Jim Aparo’s best work. Here is a particularly scary cover from his run. Great image of the Spectre and pretty startling image of a bad guy getting his hands melted. I have to grab my coat, I’m shivering! Adventure Comics #431. What is the 70’s without Jim Starlin. 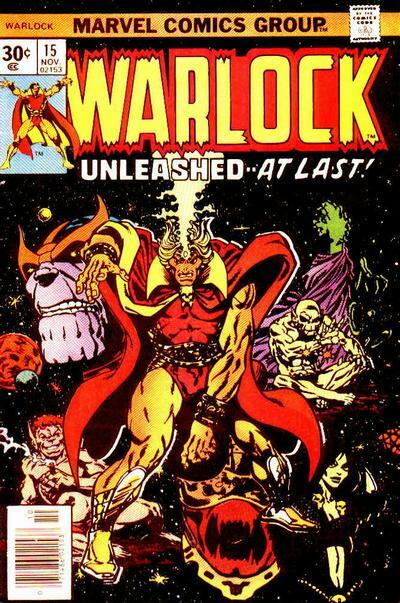 He brought us the groovy cosmos 70’s style with his work on Captain Marvel and Warlock. A lot of good covers crammed in that run but this is my favorite. Great central figure with a nice collage of characters surrounding him. A very movie poster feel to it and nice black background to boot. 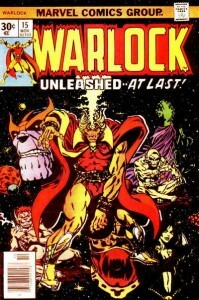 Warlock #15. Did you notice the rather high volume of monster and barbarian covers on this list? Is it simply a sign of the 70’s or my own predisposition? Hmmm……..
And to think I still left off Amazing Spider-man #90, #100 and #136. 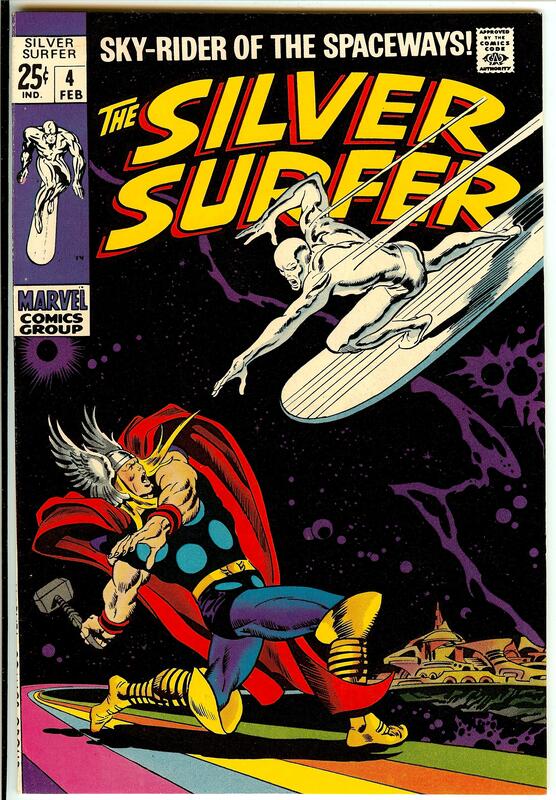 Let’s not forget Ghost Rider #1 and Thor #171 and too many Neal Adams covers to mention along with several more I was thinking about. Ah, I give up! Here we are now in the third decade of comic covers (actually the 4th decade but for my purposes of the top 10 covers, it is the third) and what a chore it has been making these lists. If I knew it would be this hard I never would have started. But as my old grandad used to say, “if it can’t finish it, don’t start it”. He never actually said that but it is a good saying and I plan to adhere to it. 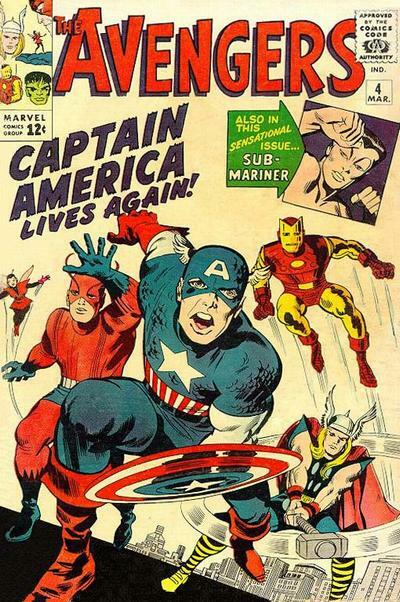 Marvel really changed the face of comics in the 1960’s. 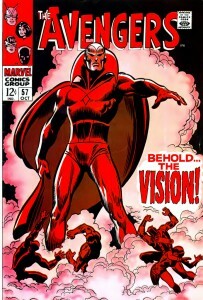 Stan Lee, Jack Kirby, Steve Ditko and later John Buscema, John Romita, Gene Colan and Jim Steranko really redefined and re-popularized the super-hero. So many great and iconic heroes and stories came out of this decade and a lot of what we now consider great and classic covers. Don’t be alarmed when you see the absence of Neal Adams on this list. His best cover work was in the very early 70’s which, of course, is my next list. As usual let me give a quick shout out to the runner’s up of note. Amazing Spider-Man #39 and #33, Fantastic Four #1 and 51, Nick Fury #4, Thor #127, Avengers #4, Daredevil #38 and #53, Tales of Suspense #20, 58 and 95, Strange Adventures #207 and #208 and The Spectre #1 and a couple of Nick Cardy greats, Teen Titans #14 and Aquaman #42. How could I possibly leave any of these off the list? You try and pick 10 out of this decade! Enough kibitzing, let’s now take a gander at my top 10 from 1960-69. This is so obvious, do I really need to even list it? Of course I do! Amazingly (pardon the pun) Jack Kirby really nailed this considering Stan chose Ditko to do the story and the subsequent on going series because Jack drew Spidey to bulky (so the story goes). Strong and heroic central figure. Simple but great composition. A top notch first appearance cover for an iconic superhero. 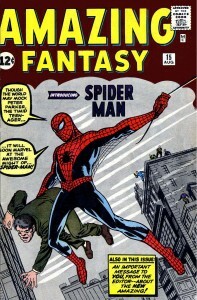 Amazing Fantasy #15. 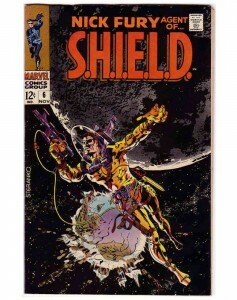 Jim Steranko had a huge Kirby influence in his early work but later he grew into his own spectacular self . This is just plain cool. 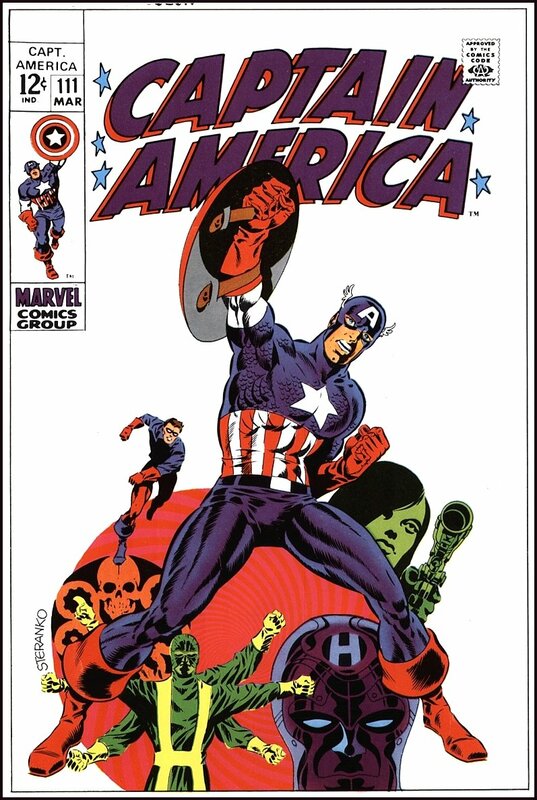 Steranko’s main strength was his masterful and often ingenious story-telling but he also did several outstanding covers. 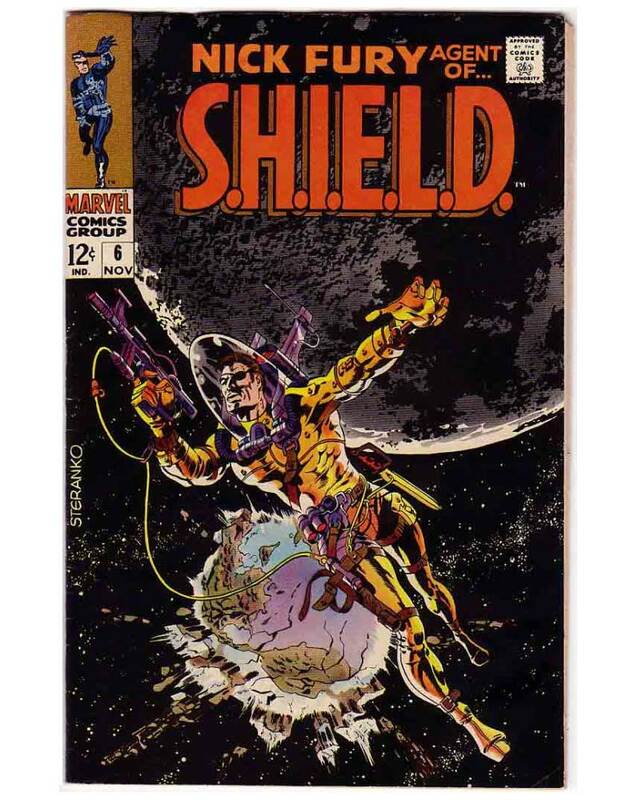 This is not necessarily considered one of his “classic” Nick Fury covers but I think it is his best. Nick Fury, Agent of Shield #6. Unfortunately you are not going to see many DC covers during this era because, let’s face it, Marvel buried them in the cool factor. While DC heroes were growing large heads and having strange weight gaining problems, the Marvel characters were duking it out with villains and saving the universe from destruction. 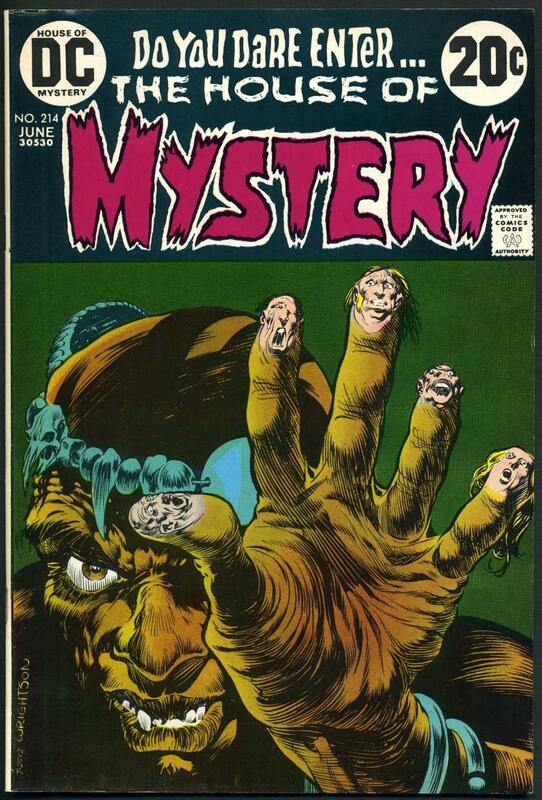 This cover, however, by the masterful Joe Kubert really stands out. It is dramatic, powerful and a little bit scary. In other words, it has everything you would want to sell a book. Atom and Hawkman #40. Talk about a powerful image! 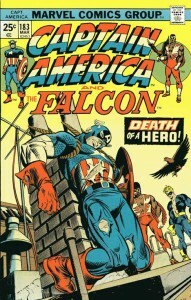 Gene Colan knocked this out of the park. Another great example of how to do a cover to a first issue. It is over-flowing with dynamic energy. How could anyone walk by this on a newsstand and not buy it? Iron Man #1. Is this the greatest cover of all time? Some would say, “yes”. I might say “yes” and you wouldn’t have to put a gun to my head either. It is without a doubt one of the best of this decade if not the best. John Buscema gives us all of the dynamics of Kirby but with better drawing skills. You can’t wait to see these two titans collide! Silver Surfer #4. What? More Steranko? You had better believe it. He did several covers with a large central image surrounded by a collage of smaller supporting images. Nick Fury, Agent of Shield #4 comes to mind but this is his best. Great Captain America figure and sensational design. I paid homage to this cover (and a combination of others) with my cover to Deadpool #-1. The only thing that might be cooler than this cover is the art inside the book. Classic! Captain America #111. Time for Kirby again and back to back Captain America selections. 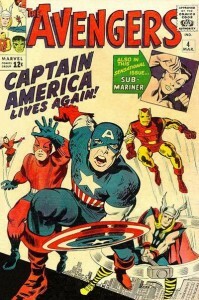 Kirby did three covers in the 60’s that were very similar: Captain America #100, Sgt. Fury #13 and this one. Since this was the first and easily the most important of the three, it gets the nod. Although Kirby’s Marvel style was still developing, this cover showed the first real breakthrough in what would become known as Kirby dynamics. Yet another great example of how to introduce (or in this case re-introduce) an important character. Avengers #4. I told you Marvel was dominating this list. 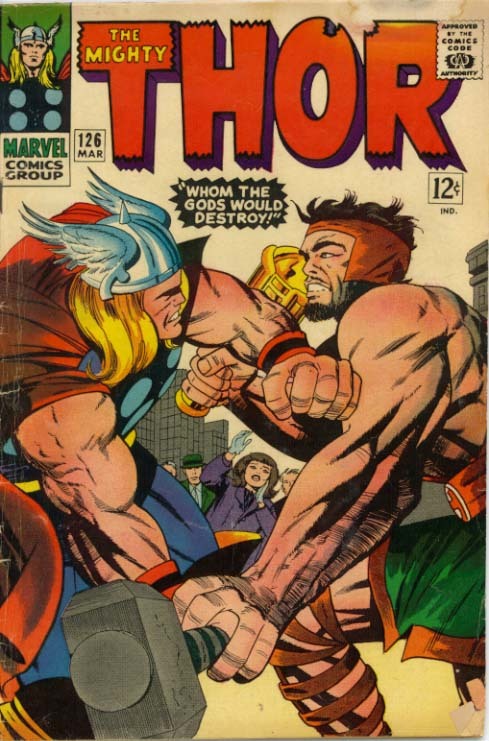 How can you not include this gem by John Buscema? Another great example of how to introduce a character. Bold, dramatic and so well drawn. The stark red coloring doesn’t hurt either. There is nothing like great figure work to win me over. Avengers #57. It looks like red must be the ticket to get on this list. I so badly wanted to put Amazing Spider-man #39 on this list but I couldn’t squeeze it in. This, however, was a no-brainer. 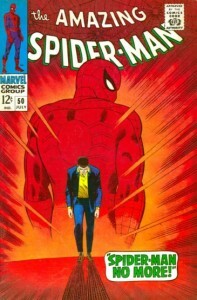 What a big powerful image by another really strong artist, John Romita Sr. This cover just oozes drama. To see an image of Peter Parker walking away from Spider-man made this a must buy. The image on the last page of Parker walking away from his Spider suit hanging out of a trash can ain’t bad either. Amazing Spider-man #50. There has to be another Kirby cover in here, doesn’t there? Why, yes there does. But which one? I couldn’t find one Fantastic Four cover that really knocked my socks off. #’s 1, 16, 25 and 51 came close but for my money I always liked Kirby on Thor. There is a ton of really good covers to choose from in that run as well. But this one to me really defines the essence of Kirby. Two powerful beings clashing with such force you are afraid if you get too close you will get squished. Thor #126. Wow, is that 10 already? I could easily do 10 more. What a rockin’ decade for comics. I wasn’t old enough to start reading comics unitl the mid 70’s but oh how I wish I could have gotten into these right off the spinner rack. This may technically be the Sliver Age but it was definitely the Golden Age for Marvel.